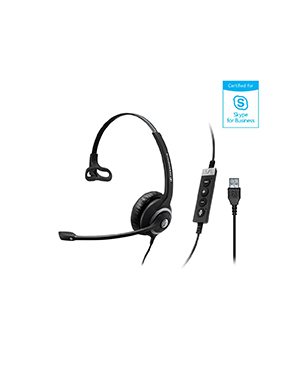 Sennheiser SC 230 USB MS II Wired Headset is a durable single-sided corded headset that has been certified for Skype for Business. This headset has an in-line call control unit, making it easier for users to have access to important call management functions and features, including microphone mute, volume control, and call answer/end. The unit also offers call redial on top of those basic call functions. Sennheiser SC 230 USB MS II Wired Headset offers users a comfortable headset, with bendable boom arm and 350-degree rotation axis. The boom arm helps in ensuring that the microphone is in optimal position for which users can be heard more clearly. It is also an excellent device that serves as an investment since it has been built to last, with a durable and robust design, as well as metal reinforced headbands. CALL US right now and dial our company hotline Australia wide 1300 131 133 find out more! Created by Dr. Fritz Sennheiser in June 1, 1945 in Germany, Sennheiser has always been focused in the realisation of incredible ideas. It currently has headquarters all over Germany, including Lower Saxony, Hanover, and Wedemark. And up to the present, the company continues to set the trend in the market and audio industry. In fact, the company is known to be passionate with what it does and in the process was able to inspire innovation like no other company can. Sennheiser started out in the market with voltmeter as its first product. And it has expanded its product portfolio to the development and manufacture of high quality audio products and solutions, including headphones, avionics headsets, microphones, telephony accessories, and business, professional, and personal applications and solutions. Sennheiser and its operations are led by Chairman of the Board and CEO Daniel Sennheiser, along with more than 2,000 employees working for the management. It can even be considered as one of the frontrunners in the audio electronics industry.